This tea is made of Yunnan high mountain tea leaves, rich in jasmine fragrance and can brew for many steeps. This is a special kind of green tea, with a method of crafting unlike most others. After shaping the tea leaves into the pearls, fresh jasmine flower buds are piled atop them to allow them to absorb the characteristic jasmine fragrance. As a result the tea not only has the taste of a delicious green, but it carries the irresistible aroma of the flowers as well – and as a result is favored by many tea lovers. TeaVivre’s Jasmine Dragon Pearls is made from high mountain Jinggu Dabai Cha leaves, first rolled into the pearl shape and then piled with the jasmine flowers. The scenting is repeated three times over, and then once more with jasmine referred to as “no. 1 flower”, with a stronger, richer scent; the entire process is referred to as “三窨一提”. Jasmine flower tea is generally abundant in Fuzhou, but Dabai Cha jasmine pearls stand out for its stronger tea taste and lasting flavor across infusions. 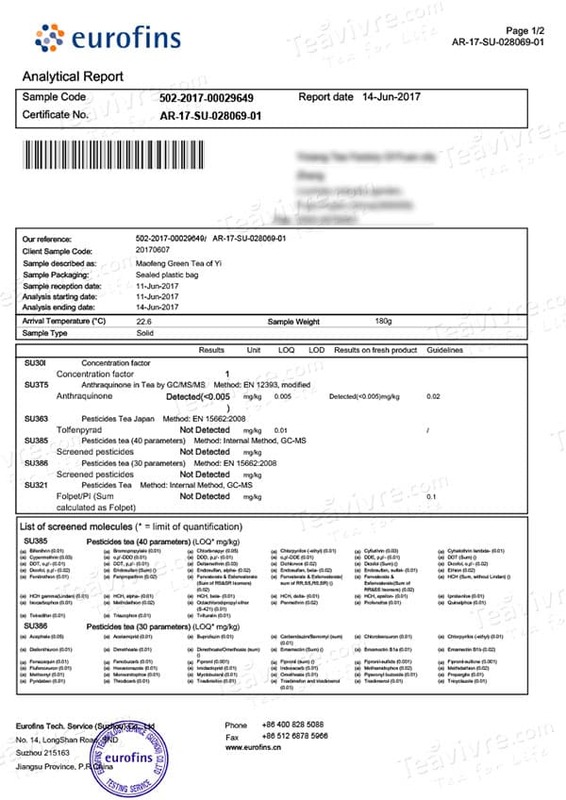 On top of this, the high-mountain environment is ecologically beneficial, so this tea easily passes the strict EU testing requirements. Upon first opening the package, the influence of the jasmine is readily apparent, lending its characteristic aroma to the pearls. This can also be tasted in the tea itself, smooth and sweet right from the start with a deeper aftertaste that lingers on the tongue and breath. Just as the leaves themselves grow and expand with further infusions, the taste also changes and deepens, eventually taking on a lighter overtone that magnifies the sweetness imparted by the jasmine. The Wen Shan tea garden is located in Jinggu County in Yunnan, at an altitude of 1800 meters. 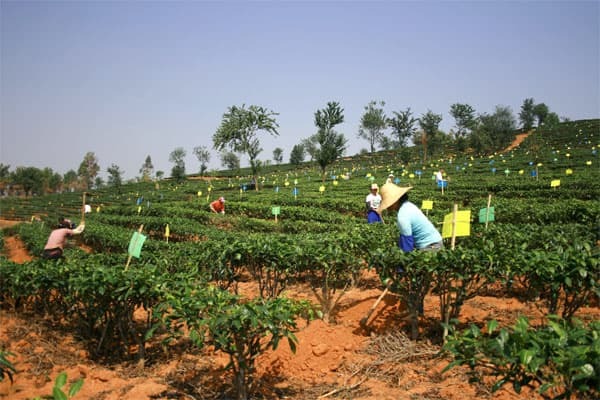 Environmental conditions such as an annual temperature of 20℃, precipitation of 1588mm, and reddish and yellow-brown soil lead to this area being a prime location for planting tea, walnuts, and other crops. Along with these superior conditions, this garden also houses many two-hundred-year-old ancient tea trees, which are not very big but have many branches. The trunks of these trees are coated with many mosses, further highlighting the excellent environment. 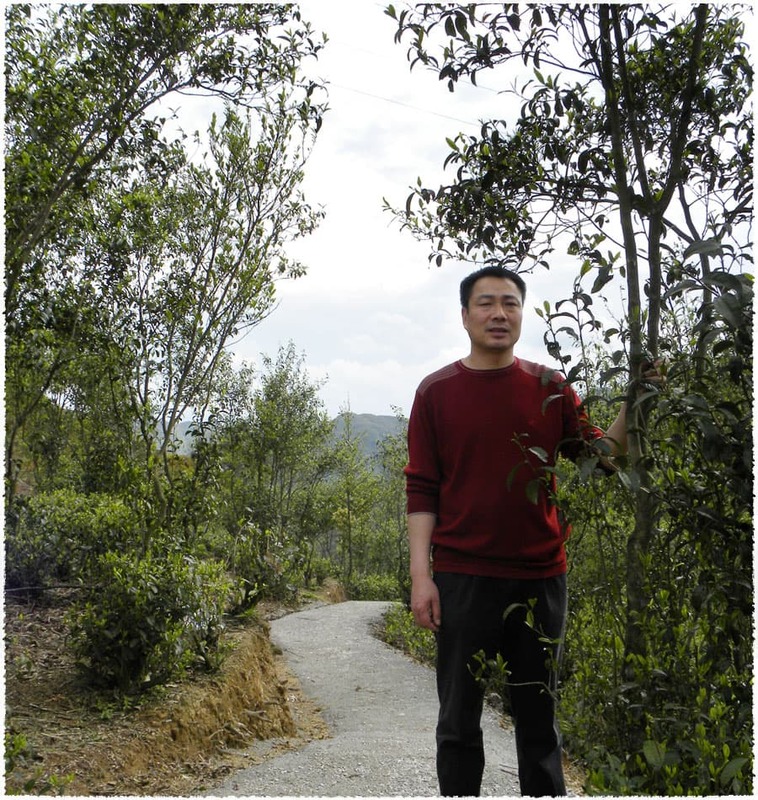 Mr. Lin, born in Fuding in the Fujian province, grew up surrounded by tea: as a child he helped pick leaves after school during the seasons where there were not enough other workers to help. This is when he first discovered his dream of entering the tea business - "My original idea was simply to make a good life for my family through growing tea. 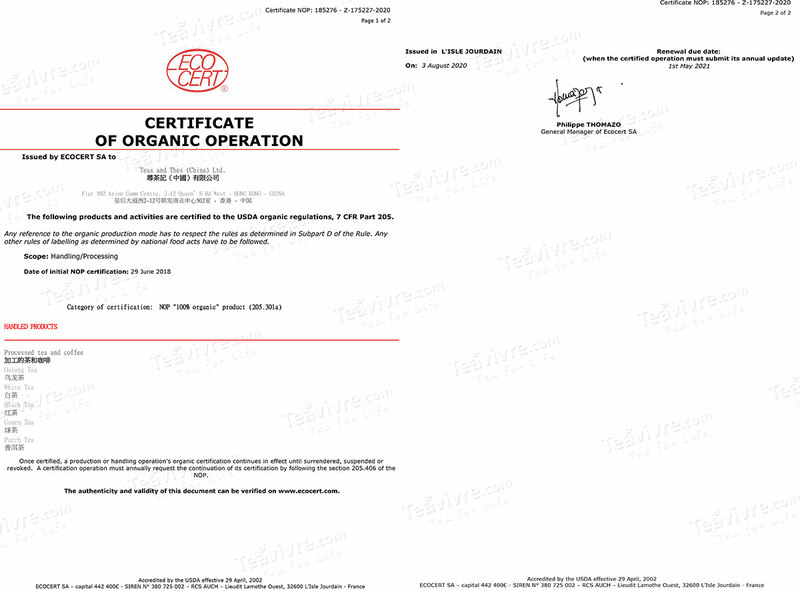 In 1993 when my tea business had gradually developed, I changed my mind: I wanted to make my business long-term and organic." He is a man of a frank manner who speaks quickly, walks quickly, and works quickly. With this, it would not be too much of an exaggeration to say that Mr. Lin is one of the founding fathers of modern day Chinese white tea: he owns nearly 2800 acres of high-grade tea gardens in Fuding, including 500 acres dedicated to entirely organic trees, the first garden in Fujian to earn organic certification from all the USA, Europe, and Japan. Along with this, he owns a 200 acre jasmine tea garden in Guangxi Province as well. In 2008 his Silver Needle white tea won a gold medal at the annual Chinese White Tea festival in Beijing. 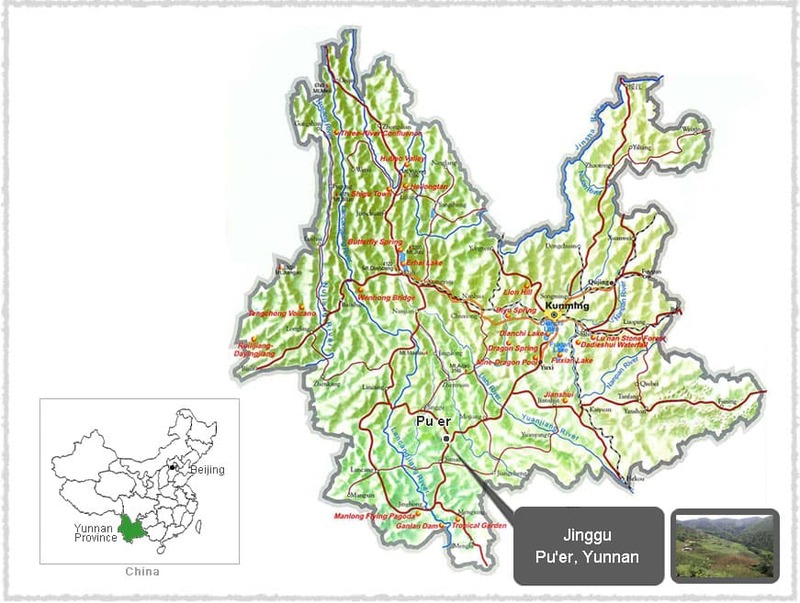 Jinggu is located in Pu'er City in Yunnan, China, and is the birthplace of Jinggu Dabai Cha. This region's altitude ranges between 600 and 2920 meters, with an average of 1354mm of rainfall and 2065.3 hours of sunshine per year. The area is known for its high mountains and deep valleys of varying elevations, marking it as suitable for growing many different types of tea. Other than Dabai Cha, Jinggu is also renowned for other products such as rosin, Xiangya mango, Yangta white tea, fragrant sticky rice, and others. The jasmine used to scent this tea, produced in Guangxi Province in China, has earned nationwide recognition. Hengxian is the important production area, known as "the city of Chinese jasmine" due to its expansive planting area and capability of producing both high-yield and high-quality flowers. 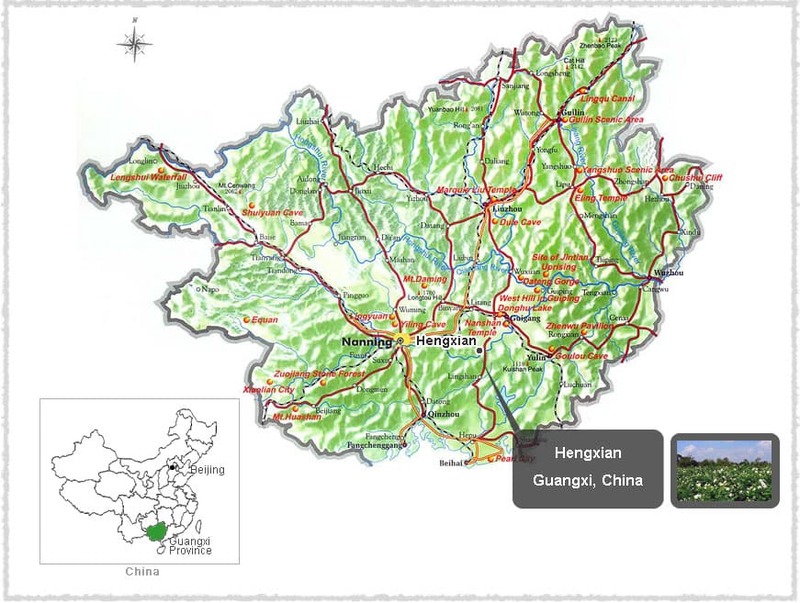 Located in the southeastern region of Guangxi, Hengxian covers a total area of 3464 square kilometers. Jinggu Dabai Cha naturally belongs to an arbor tea tree sourcing from Mt. Kuzhu in Jinggu County. Theses particular plants are locally abundant in the area, and can naturally reach up to five meters tall with thick trunks and sparse branches. Dabai Cha is characterized by its large, soft leaves, and plump fuzzy greenish-white buds. 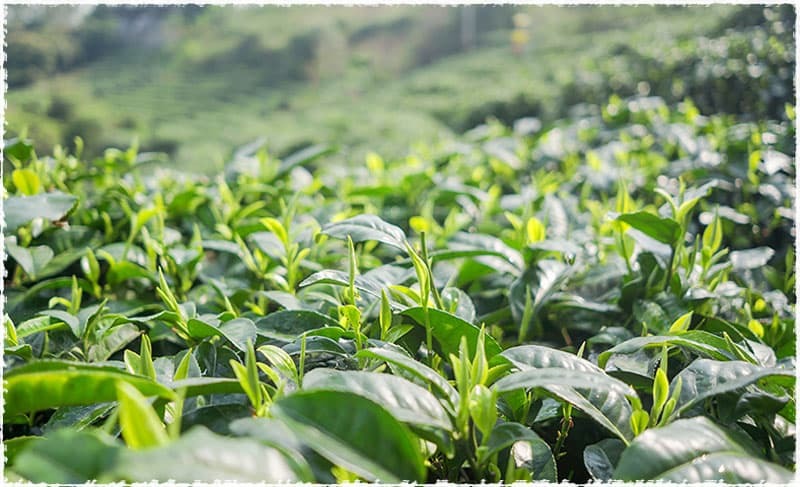 This tea is picked in spring as one bud and two leaves, and is high in soluble compounds. Because of this it is rich in flavor and leaves a sweet lingering aftertaste in the mouth and throat. 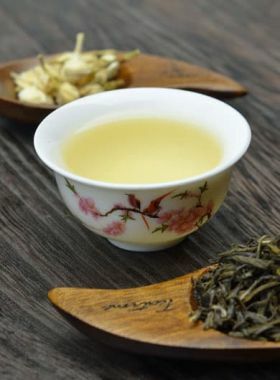 Tea made from Jinggu Dabai Cha is fairly representative of the special features of Yunnan large-leaf varieties, often used to make high quality pu-erh. 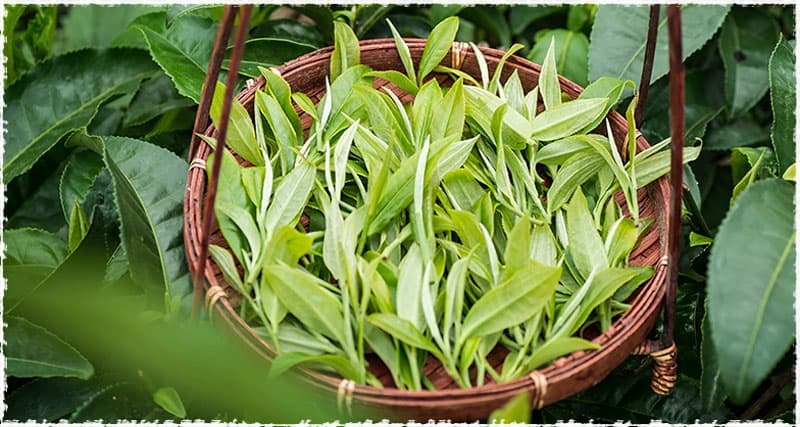 The history of scented green tea reaches back over a thousand years, to the first known innovation of spices and flowers added to tea during the Chinese Song Dynasty around 960AD. The Ming Dynasty during the 1500s saw the introduction of the scenting method still used today, where the flowers are added to the tea during processing and prior to drying. However, this type of tea was rare in this time due to the complexity of this type of processing. Then in the mid-1800s during the Qing Dynasty, production methods were perfected and the number of tea gardens rapidly increased, leading to increased production and cheaper prices. This in turn resulted in scented tea becoming widely popular in China, a status which it still retains today.